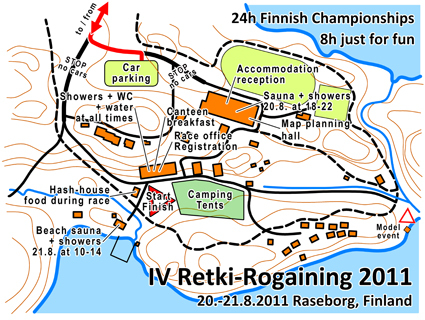 There will be Mini Retki Rogaining with 8h and 4h classes somewhere in Pirkanmaa 26.5.2012 and Retki Rogaining 2012 with 24h and 8h classes in southern Finland 28.-29.7.2012. One fourth of the competition has passed now. Very first competitors of the 8h series just finished and everything is set up for receiving the rest of this class to the finish. While getting the results for the 8h, the real challenge for the 24h teams is starting - as the night falls. This year there are all together 80 teams in 24h series and 51 teams in 8h series. Let's keep thumbs up for all the teams! Please follow the signs from Karjaa and Pohja villages to the race center. There are several water stations in the terrain. Water is either from wells or in water canisters. You might find pure water from lakes or rivers but even then we recommend you to use some water purification agent. More info about water stations can be found from the race map. Finnish adventure race ArticCircle24h used also SPORTIdent cards. They have made very good instructions "How to attach SPORTIdent card in your wrist" you can read instructions here. There will be resonable price. During the race, between Saturday 14.00 and Sunday 14.00, there will be food served in the hash-house. This service is included in the registration fee. There is a short model event on Friday 19.8. starting at 18. You will get a small piece of the competition map in scale 1:40000. You are free to walk or run to visit a few special controls. This way you might get an idea of the map and the terrain. But remenber, don't take it too seriously, as you do not get any points on Friday. There will be intensive battles for the Finnish Championships in 24h MO, WO and XO categories. All juniors, veterans and super veterans are naturally also in the battle. Tomorrow is the last date to register. After that we cannot quarantee your participation, as we might run out of SI-cards. What should be the level of difficulty in a championships rogaining event? Once again we look at the preliminary competition map to make last adjustments. There are large areas of the terrain very fast and checkpoints easily accessible, but, then there are areas where speed is reduced to the minimum and checkpoints are either very difficult to reach or find. To collect the most difficult checkpoints youâ€™ll have to be certain of your route and awake. Anyway, all checkpoints are clearly placed and accurate with the map, they just have different levels of difficulty. Examples of the preliminary competition map. You can find those photos in Retki-Rogaining official photo site. Great! There are now over 100 teams and more than 230 rogaining enthusiasts registered in the competition. And more people, also beginners, are registering all the time. Itâ€™s good to see strong participation from both Finland and abroad in this demanding ultra distance orienteering event. Some people describe rogaining as extreme sport, but it is up to you how hard you push yourself in the event. Keep in mind that this sport is mostly about tactical orienteering, but also knowing your physical capabilities and strong team work.